Ms. Danielle Atchison has volunteered as a judge for several years at state level We the People competitions and is honored by the invitation to participate as a judge in the national competition held in Washington, DC in April 2017. 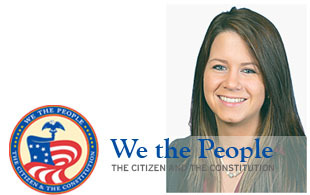 The We the People: The Citizen and the Constitution Program promotes civic competence and responsibility among the nation’s upper elementary and secondary students. The We the People program’s culminating activity is a simulated congressional hearing in which students “testify” before a panel of judges acting as members of Congress. Students demonstrate their knowledge and understanding of constitutional principles and have opportunities to evaluate, take, and defend positions on relevant historical and contemporary issues.